JOHANNESBURG, South Africa, October 24, 2013 (ENS) – In a decisive move away from private vehicle use towards public transport, bicycle routes and pedestrian walkways, the City of Johannesburg has launched the second route of its Rea Vaya Bus Rapid Transit System. Some 134 buses will carry passengers on Route 1B, and 57 of them were built locally. The city made a conscious decision to manufacture these buses locally to create more job opportunities for area residents. The Rea Vaya bus fleet runs on biogas and low-sulphur diesel, which emits less greenhouse gases than other types of fuel. The contract for Phase 1B buses was awarded to Sandown Motor Holdings. 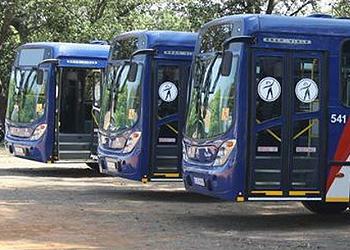 The chassis were manufactured by Mercedes Benz and the bus bodies provided by Marco Polo. 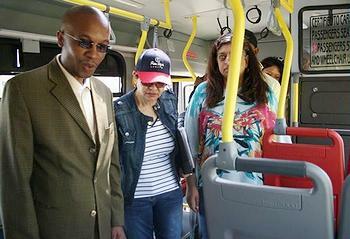 The new route was launched October 14 on the fourth anniversary of the opening of the first Rea Vaya BRT route in 2009. Johannesburg has identified the Rea Vaya routes as “Corridors of Freedom,” places in which the city can begin to redefine itself. The bus routes are an important support to Joburg’s campaign to transform entrenched apartheid settlement patterns and create an environment where everyone can feel safe. Executive Mayor Mpho Parks Tau says these corridors will allow for the increase of intensity of land use as well as density, in order to achieve urban efficiencies. “The mayor is not only celebrating the fourth birthday with the citizens of the City of Johannesburg but is also here to start the celebration of the launch of the Phase 1B Corridor of Freedom on 14 October, as committed in his State of the City address in May,” said Christine Walters, Joburg’s mayoral committee member for transport at the launch party for the new BRT route. Some improvements have been made to the buses such as: a self-operated lift for people with disabilities; flaps to close the gap when docking at the stations to improve safety; luggage racks; heaters for use during cold winter days, digital screens, and cameras to help the drivers with docking and additional passenger safety. At the new route’s 13 new bus stations, there are installed bike storage racks, trash receptacles and seating, artwork by respected South African artists and beautiful landscaping with plantings of indigenous trees, all contributing to an atmosphere of safety and efficiency. Joburg’s transport department is working with its development planning department, the Johannesburg Development Agency and other stakeholders to develop walking and cycling pathways along this route. This will contribute to the mayor’s healthy lifestyle program and complete streets policy. The mayor is satisfied that the bus rapid transit system resolves an old conflict between the taxi industry and public transportation. About 12 taxi associations will be affected by the new Rea Vaya route, but the city government and the public transport operators have agreed to some actions, such as a sustainable business model, that will help ease the pain for them. The city has agreed to the removal of competing vehicles from the route and the scrapping or disposal of old and unsafe taxis, as well as the empowerment of taxi drivers to enable them to become bus drivers. Inspired by Rea Vaya’s example, Johannesburg’s Metrobus is buying between 125 and 175 new cleaner, greener buses that will run on biogas or diesel. The decision by the city for Metrobus to use biogas follows from several studies showing the enormous potential for biogas production from city waste sources such as landfill sites, sewer plants and grass cuttings by Johannesburg City Parks and Zoo. The city is working in partnership with the University of Johannesburg and the South African National Energy Development Institute to refine the technology for biodigesters that can use grass and other non-food agricultural products to produce fuel. “We are very excited to tell our passengers and the residents of Joburg that we will be able to replace more than one third of our ageing fleet with modern, low-floor and dual fuel green buses,” said Lawrence Maqekoane, the acting managing director of Metrobus.